Contract Bridge is an auction and trick-taking card game for four players. The aim of the game is to earn points by winning as many tricks as possible. The players are divided into two teams of two. 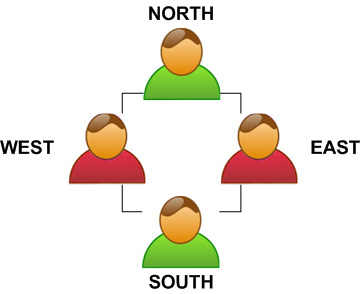 Each player is designated a compass direction, with partners sitting opposite each other (i.e. East-West will play against North-South). The game is played with a single standard 52-card deck, although having two decks available can move the game along more quickly. Bridge is played over a series of hands. Each hand consists of two parts: the auction, where the partnerships bid against each other based on how strong they think their cards are; and the play, where teams try to win enough tricks to make or defeat the contract reached in the auction. Points are awarded depending on success or failure, and then another hand begins. Winning enough points earns a partnership a game. 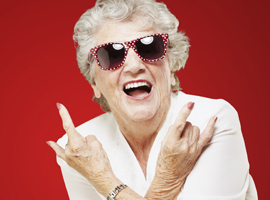 Winning two games makes a rubber (except in Duplicate Bridge, where each hand is treated independently). One player is designated the dealer. He shuffles the deck and deals them all out clockwise, starting with the player to his left. Each player takes their 13 cards, looks at them and then sorts them. Cards are divided by suit and ordered by rank, with ace being the highest and 2 the lowest. The difference between the suits is important for the auction and scoring, but not for play. 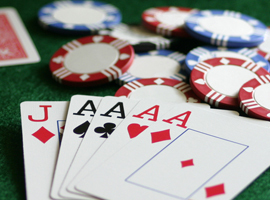 Once the hand is completed, the player to the dealer's left becomes the new dealer and a new hand begins. If you're playing with two decks, the deck not being used for the hand can be shuffled and placed ready for the next dealer to make the game flow more quickly. Bridge is a trick-taking game. If you know how to play other popular games like Whist, Hearts or Spades then you'll find that the cardplay of Bridge is very similar. Although the auction comes first (see below), it's easier to understand once you know the basics of play. All you need to know for now is that the auction will determine the contract for the hand. The contract will specify a number of tricks and a suit for trumps (although there may be No Trumps). The team that bids the highest is the declaring side. The other team is the defending side. The declaring side will try to win the number of tricks bid, while the defending side will try to stop them. A trick is a set of four cards, one from each player. 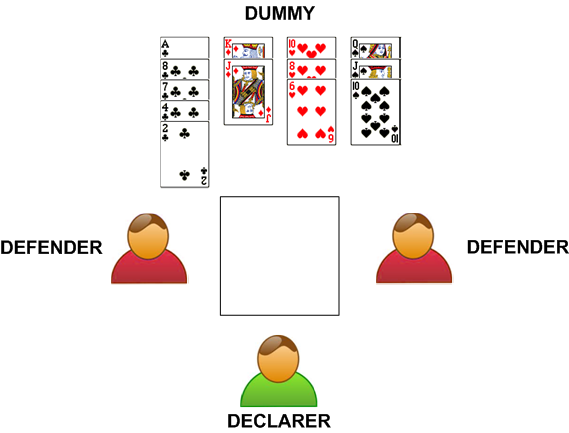 The player to the left of the declarer (see below) leads the first card of the hand and play proceeds clockwise until all four players have played. The first card of each trick determines the suit. If possible, players must follow suit by playing a card of the same suit from their hand. If no such card is available, then another card may be discarded, but it cannot contribute to the trick unless it's a trump (see below). The player who contributed the highest ranking card wins the trick for their team and gets to start the next trick. Once all thirteen tricks have been played, each pair counts up how many they've won. If the declaring side has made their bid (or higher) then the contract was successful. If not, the contract was defeated and the defending team will score penalty points. If the auction (see below) resulted in a suit contract, then than suit will be trumps for the entire hand. Players must still follow suit if they can, but if they've run out of the chosen suit they may play a card from the trump suit instead. This is known as ruffing. A trump beats cards from all other suits, so ruffing is a very powerful technique. If two or more trumps are played in the same hand, then the highest trump wins the trick. The dummy separates Bridge from most other trick-taking games. Every hand, one member of the declaring side sits out as the dummy. Their entire hand is placed faced up on the table for all players to see. Although the order of play doesn't change, the declarer decides which cards to play from both his hand and dummy's. Once the contract has been decided, the pairs are split into the declaring and defending sides. The player on the declaring team who first mentioned the contract suit during the auction is the declarer. Their partner will be the dummy. The player to the left of the declarer leads the first card blind, just based on what they can see in their hand. But once this card has been led, the dummy hand is placed face-up on the table for all players to see. For convenience, the cards are arranged in columns with alternating suit colors and the trump suit on the right (declarer's left). For many players, the auction is the heart of Bridge. This is where the contract that governs the play of the hand will be decided. For example, a bid of 1 means taking at least 7 tricks with clubs as trumps. A bid of 4 means at least 10 tricks with hearts as trumps. A bid of 7NT means taking all thirteen tricks with no trump suit. Like any other auction, each bid must be higher than the last. The numbers are treated as you would expect, with bids at the 7 level being the highest and bids at the 1 level the lowest. But within each level, the suit rankings come into play. The suits are ranked Clubs, Diamonds, Hearts, Spades, No Trumps, from lowest to highest. (An easy way to remember this is that the suit names are in alphabetical order.) So the lowest possible bid is 1C and the highest is 7NT. The suit ranking means that if, for example, the bid currently stood at 3 , a bid of 3 would not be allowed. If someone wanted clubs to be trumps they would have to bid at the 4 level or higher. If you do not want to bid you can pass. Unlike some other auction games, passing doesn't forfeit your right to re-enter the auction later. Once three players have passed in a row, the last bid made is the contract for the hand. The person in the winning team who first bid the trump suit will be declarer. Be careful here: often this will be the person who made the final bid, but not always! If all four players pass before making a bid, the hand has been passed out. No play occurs, and the next dealer deals a fresh hand. The auction is the chance for players to share information about the strength and weakness of their hand with their partners (naturally, no other communication about the contents of a player's hand is permitted). Most bids will be natural, with the suit choice indicating a preference for that suit and the number indicating hand strength. However, bids can also be used to signal other kinds of information, sometimes completely unrelated to the suit and number of the bid. These prearranged bid signals are collectively known as a bidding system. 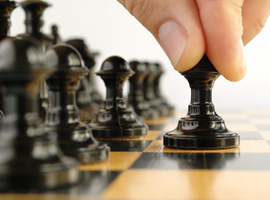 There are many different kinds of bidding systems with varying levels of complexity. Players who regularly play together in a partnership will try to employ a bidding system that complements their play style. Another bidding option is to double. If a player doesn't think their opponents can meet their bid, but doesn't want to be in a contract of his own, he can double. This drastically increases the penalty points for defeating a contract, but it also doubles its value and increases the rewards for making overtricks. A doubled contract can then be redoubled by the other team. Bonuses and penalties for a redoubled contract are twice those for a doubled one. A double or redouble only stands if the other three players then pass. Any other bid cancels the double, although there's nothing to stop a player from doubling this new bid. In rubber bridge there is a score bonus for successfully making a doubled or redoubled contract. These are known as points for the insult. The bonus is 50 for a doubled contract and 100 for a redoubled one. Bridge scoring can seem a little complicated at first, but you'll soon get used to it. 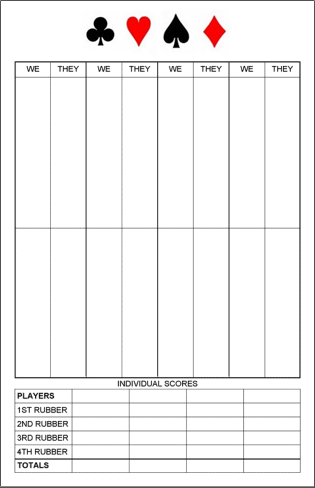 Many packs of cards come with a special bridge scoring card that you can use as a reference. One player is in charge of the scoring. Two columns are headed "WE" and "THEY" to designated the scorer's team and their opponents, respectively. A horizontal line is drawn half-way down. Points that contribute towards a game are written below this line, while bonuses, penalties and other points are written above it. The difference between these two affects the course of play, but at the end of play all of the points are added up, with none being more important than the others. Contracts are worth different amounts depending on the number of tricks and the suit bid. Clubs and Diamonds are known as the minor suits, and tricks bid and made here are worth 20 points each. Hearts and Spades are the major suits, and are worth 30 points per trick. A No Trump contract is the most valuable and calculating the score can be a little tricky: the first trick is worth 40, whereas subsequent tricks are worth 30. To match the bidding levels, only the tricks after the sixth are counted for contract points. So a contract of 1C bid and made requires seven tricks but is worth 20 points (1 x 20). A contract of 3H requires nine tricks and is worth 90 points (3 x 30). A contract of 5NT requires eleven tricks and is worth 160 points (40 + 4 x 30). Points for tricks bid and made go below the line (that horizontal line across the two columns). Once a team has 100 points or more below the line they have won a game. As soon as that happens, a new line is drawn beneath all the scores and the scores below the line are reset. Winning a second game ends the rubber, and the winning team gets a large bonus. This is worth 500 points if the team wins two games to one, or 700 if they win two games to nil. Because the aim of Bridge is to win games and rubbers, it's helpful to consider the lowest bids for each suit that can win a game outright. For the minor suits this is at the 5 level (5 x 20 = 100). For majors it's at the 4 level (4 x 30 = 120). But the extra 10 points for the first No Trumps trick means that 3NT is sufficient (40 + 3 x 30 = 100). It's also important to remember that doubling and redoubling affects the base value of the contract as well as the bonus for overtricks. This doubled or redoubled value goes below the line, and can allow a team to score game at a much lower level than usual! Because only a hundred points are needed for game, it may seem that there is little point in bidding at the higher levels. But there are special incentives for bidding and making contracts of twelve or thirteen tricks. Making twelve tricks is known as a small slam and is worth 500 points. Bidding and winning all thirteen tricks is known as a grand slam and gets a bonus of 1000. These bonuses are not affected by doubling, but if the pair making the slam is vulnerable (see below) then the bonus is increased by 50%. Once a team has won one game they become vulnerable. A vulnerable side faces far stiffer penalties for missing their contracts. Conversely, the rewards for slams and overtricks are increased. Vulnerability is a key bridge concept that affects a lot of the strategy, especially when both sides are at different vulnerabilities. The tables below show the different points and penalties available at different vulnerabilities. In rubber bridge there are a few miscellaneous bonuses for holding certain high cards. The top five cards in a suit (T, J, Q, K, A) are known as the honors. Having four trump honors in a single hand is worth 100 points, and having all five is worth 150. In a No Trump hand, having all four aces scores 150 points. Here are some tables outlining the points and bonuses awarded for different contracts and vulnerabilities. Overtricks in undoubled contracts are worth the same as normal tricks in the bid suit, regardless of vulnerability. For doubled and redoubled contracts the contract suit no longer matters, but vulnerability is taken into account. And here are the penalties awarded to the defending team if a contract is unsuccessful. Again, the contract suit is irrelevant.